Ideal for a weekend break or a family holiday, this house is spacious with separate lounge and dining room as well as 3 bedrooms and a large bathroom. Completely renovated. 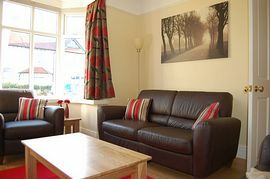 Within 5 minutes walk of long sandy beaches in the lovely village of Rhos-on-Sea, close to Snowdonia. Dogs welcome. Free WIFI. Downstairs: Large hallway, lounge (with leather sofas including a double sofa bed), separate large dining room, kitchen incl. 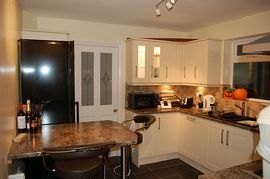 breakfast bar with 2 stools, small utility room with washer/dryer, downstairs cloakroom with W.C. and basin. Door to secure back garden. 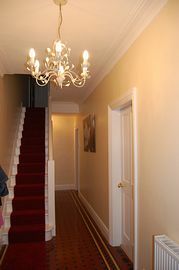 Upstairs: Spacious landing, off which there are 3 bedrooms and the family bathroom. 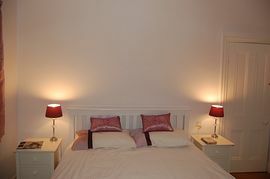 Bedroom 1 is a double bedroom with king-size bed, and matching bedroom furniture. Bedroom 2 is a large room with 2 single beds and a desk, plus usual bedroom furniture. Bedroom 3 has a bunkbed, with matching storage bench and chest of drawers. 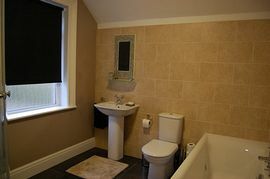 This lovely house is available for short breaks throughout term-time, and for whole weeks during the school holidays.